Chris Christie's new book on Trump's White House will be released this week. President Donald Trump asked former New Jersey Gov. Chris Christie multiple times if he would be willing to be vice president, according to an excerpt from Christie's upcoming book. Christie lifted the veil on his friendship with Trump in "Let Me Finish: Trump, the Kushners, Bannon, New Jersey, and the Power of In Your Face Politics," which is out this week. (Shawn Thew-Pool/Getty Images) From left, White House senior adviser Jared Kushner, New Jersey Gov. Chris Christie and President Donald Trump attend a panel discussion on opioid and drug abuse in the Roosevelt Room of the White House, March 29, 2017. 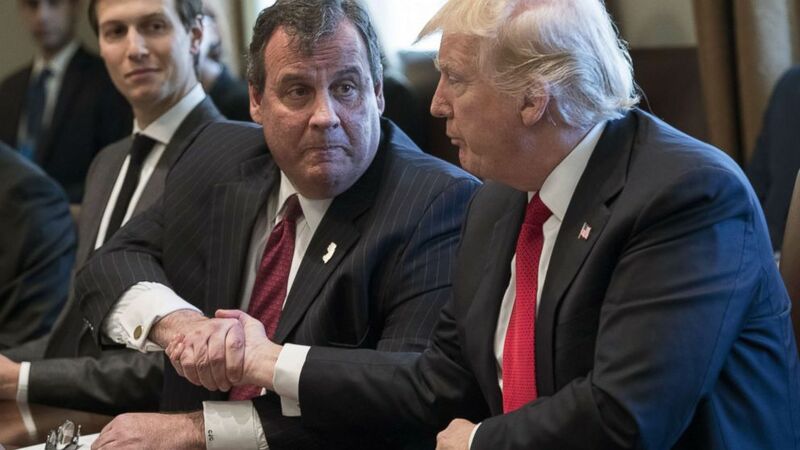 After being ousted from Trump's transition team and being passed over for a position in the administration, Christie will lead a new White House commission tasked with tackling opioid addiction nationwide. The commission will fall under the White House Office of American Innovation, which Trump appointed Kushner to manage. The former 2016 presidential candidate and ABC News contributor wrote that "one day in May" Trump called him at his office in Trenton, New Jersey, asking if he was willing to be considered as his running mate. "I don't think he was surprised by my answer," Christie wrote, adding that he'd been open about his "interest in the job" since the day he and his wife, Mary Pat, showed up to Trump Tower to endorse Trump's candidacy. 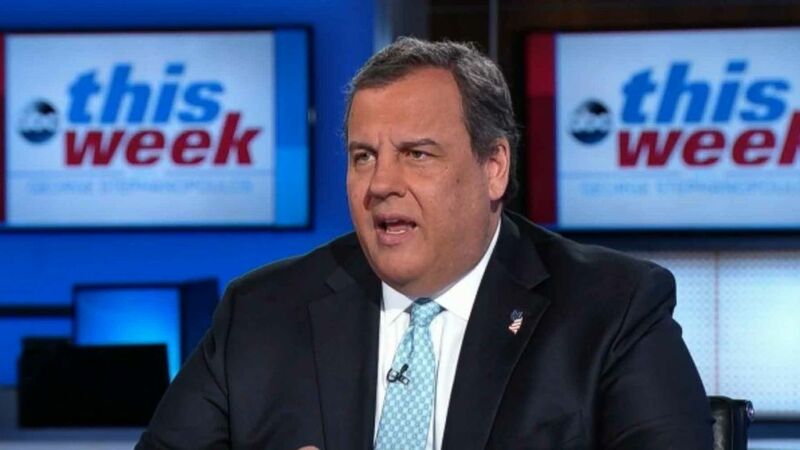 (ABC News) Former New Jersey Gov. 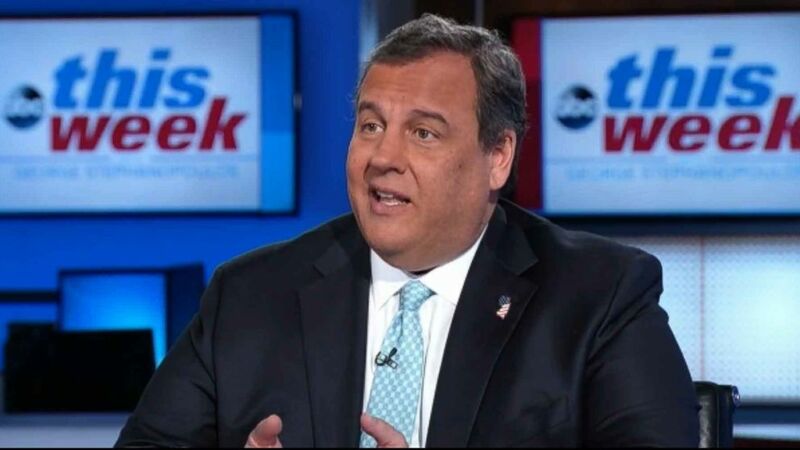 Chris Christie appeared on "This Week," Jan. 27, 2019, to promote his new book, "Let Me Finish: Trump, the Kushners, Bannon, New Jersey, and the Power of In-Your-Face Politics." Christie went on to describe the confusion that ensued in the coming weeks, saying that although on May 10 of that year Trump told The Associated Press that he was considering "five or six people," the future president still called him one evening in June asking him if he was "ready." "Am I ready? Ready for what?" Christie asked. "You know what," Trump replied, according to the book. At that point, the vice presidency "didn't feel like an exercise anymore" or like "some theoretical possibility," Christie wrote. "It felt real." But, influence from the rest of the Trump clan may have been what thwarted Christie's name from being added to the ballot, and then-Indiana Gov. Mike Pence was chosen instead. An excerpt from "Let Me Finish: Trump, the Kushners, Bannon, New Jersey, and the Power of In-Your-Face Politics." Reprinted by permission of Hachette Books. All rights reserved. One day in May, Donald called me in my Trenton office and asked straight-out, “Are you willing to be considered for vice president?” I don’t think he was surprised by my answer. From the day Mary Pat and I showed up at Trump Tower for our endorsement breakfast with Donald and Melania, I’d been open with him about my interest in the job. Vice president and attorney general. Those were the two positions I had my eye on. Having been on Mitt Romney’s short list in 2012, I had some idea what to expect. I’d have to provide a giant stack of paperwork—tax returns, investment statements, speech transcripts, campaign finance reports—detailing every imaginable aspect of my personal and professional life. On May 10, Donald told the Associated Press that he was considering "five or six people." By June most of the national media seemed to agree that Trump had a short list, and it was down to three: Former House Speaker Newt Gingrich. Indiana governor Mike Pence, who seemed to have overcome his lukewarm Ted Cruz endorsement. One June evening, my phone rang again. Donald was, calling from Indiana, where earlier in the evening he’d been introduced by Pence at a rally in Westfield. “I’ve got a question for you,” he said. “Are you asking?” I said to him. As I got off the phone with Donald, the vice presidency didn’t feel like an exercise anymore or some theoretical possibility. It felt real. It felt likely. It felt like something I had better prepare myself and my family for. It was after I said good night to Mary Pat that I got a call from a high-ranking Trump staffer. This person had just been around for a discussion with family members about the vice-presidential decision. Wow. I had no doubt that what I was hearing was the 100 percent, honest-to-God truth. This person had real credibility with me. But what should I do about it? That was the question. My answer? Nothing. When the media learned the next morning that Trump was meeting with Pence again, Sean Hannity lent Newt Gingrich his plane to fly to Indianapolis and make his own pitch. People I trusted told me that my tipster was exactly right. Family members, Jared and Ivanka especially, were upset that Donald seemed to be on the verge of choosing me. They flew into action in an eleventh-hour attempt to block that. I took an early-afternoon train back to New Jersey. The whole way I was thinking, I don’t know what’s going on in Indianapolis, but I’m not hearing from anybody. That didn’t seem like a very good sign. Somewhere after Baltimore, I spoke to Eric Trump. I’d always felt close to Eric. Eric was the one person in the Trump family who was saying anything encouraging. I thanked him for calling and said goodbye. On Thursday morning, the phone rang. Donald. “Are you really sure you want this?” he asked. I did not take that as an encouraging sign. So right there, I had to make a fundamental decision. The way he asked the question, it sounded to me like he was asking for an easy way out. To hell with it, I thought. I’m pushing for this. “Yes, I really want it,” I told him. “You know it’s going to be a lot of scrutiny,” he said. Mary Pat nodded as I spoke. She was clearly with me on this. Early in the evening, I got word from my New Jersey state troopers that Mike Pence was flying into Teterboro, the airport in Bergen County that handles many of the region’s private jets. Now, that pissed me off. Donald had offered it to Pence, and he didn’t even call me. So, I called Donald. “I haven’t made any final decision,” he said. On Fox. Greta Van Susteren interrupted her coverage of a terror attack in Nice, France, to announce she had a special guest, the presumptive Republican nominee for president, Donald Trump. As soon as the Greta interview was over, Donald called me back. “Do you believe me now?” he asked. “I have not made my decision,” Donald insisted. Nothing was announced Thursday night. Friday morning, I got to the State House early. I did paperwork in my office for a couple of hours, then had a meeting. That’s where I was when the phone rang. It was Donald again. “Are you disappointed?” he asked.